From now on, Delta Airlines SkyMiles members will be able to rack up additional miles when they use the ride-sharing app Lyft. For a limited time, they can receive bonus miles when they summon a ride from Lyft to and from the airport. It comes on the heels of a similar arrangement Delta worked out with Airbnb. That link-up, announced late last year, awards miles for either hosting of being a guest. "We're thinking about our customers' whole travel experience and it's important that Delta customers are taken care of not just in the air, but on the ground," said Sandeep Dube, a Delta vice president. Delta says the system is simple. A consumer need only link their SkyMiles and Lyft accounts, then request a ride. Credit is automatically added to the SkyMile member's account. 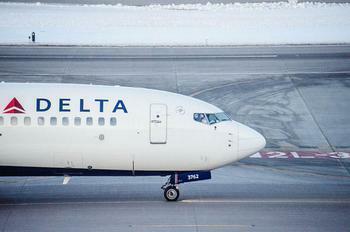 Delta says there are no restrictions, every SkyMiles member is eligible. Members will get one mile per dollar spent on all Lyft rides. During an introductory period, members will get two bonus miles -- for a total of three -- for each dollar spent with Lyft on trips too and from an airport. All Lyft rides will earn Delta miles, including Lyft Line, Classic, Plus and Premier.